In this article, you’ll find out what the best dog dental sticks are, which can be particularly useful if you have no time on your hands to do the necessary research on your own. 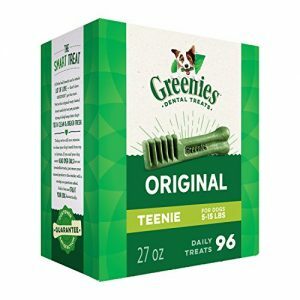 After carefully examining some of the most acclaimed products in this category, Dr. Fox concluded that GREENIES’ Original TEENIE are the ones you should consider. Suitable for small breeds, these treats provide clean teeth and a fresh breath by chewing one a day. Moreover, their taste is irresistible, which means your dog is going to love them. In case these ones are not available, the next option you should keep in mind is Dingo’s Tartar and Breath Sticks. The Greenies are suitable for dogs that weigh between five and fifteen pounds. Since they are uniquely formulated to keep your dog’s teeth clean, they also help with the smell. They can also fight off tartar and plaque, and that’s always something worth considering. They’re easy to digest. You have to make sure that you get the right size for the type of dog breed you’re the parent of. Some customers report that these might be too tiny for their particular Fidos. These easily digestible chews are great for fighting off tartar and plaque. This Dingo product has a fair price and is great at removing tartar and plaque from your dog’s teeth. The sticks are made with real chicken which means that they will be a great source of protein for your puppy. This product also contains parsley seeds and baking soda, that make your dog’s breath fresh. It is very important for you to check your dog while he eats these sticks. It would be a very bad idea for your pet to swallow an entire stick at a time, because it will upset the stomach. 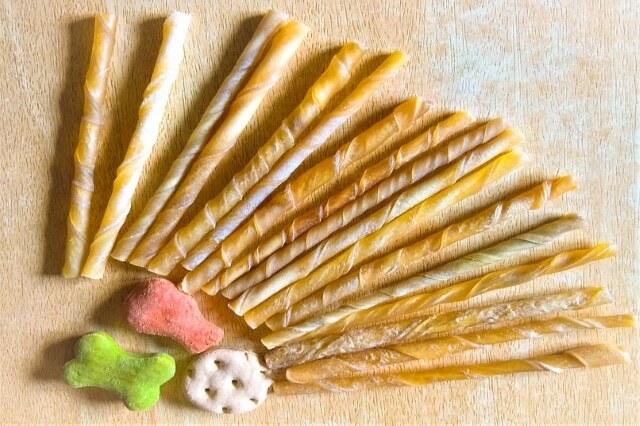 Your dog will definitely like the gum massage that this treat provides. Providing an antiseptic activity, as well as an abrasive action that will remove the plaque from your dog’s teeth, this product is great at doing its job. It is characterized as having a Dual-Enzyme system that will eliminate the bacteria easily, also making the chewing of the treats quite pleasurable. If your dog has a sensitive stomach, you have to be very careful with this oral hygiene product, because they may cause gastrointestinal problems that will hurt your fluffy one. This choice will help your dog get rid of those unwanted visits to the veterinarian. Given that finding the best dental sticks for dogs is not always as easy as it might seem, since your choice should be tailored to your dog’s needs and preferences, we decided to give you a hand and compile a selection of top-rated products that you can find below. When it comes to your dog’s dental hygiene, you might find yourself unsure where to begin the search for the optimal solution. 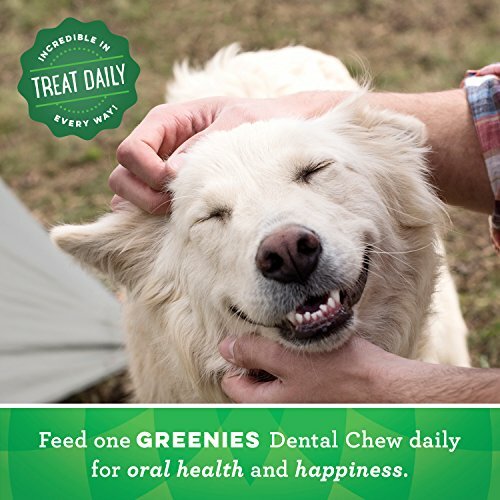 If that’s the case, then take a look at Greenies’ Original Teenie chews, as these might be precisely what you need if you are looking for some good dental sticks for dogs. Suitable for toy breeds and dogs between 5 and 15 pounds, one GREENIES Original Dental Treat a day is all it takes for your dog to have clean teeth and a fresh breath. As they are specially formulated to achieve this performance, they are very tasty, and your furry friend will be excited to get his or her daily treat. The original-flavor chews feature a delightful texture that fights plaque and tartar. Besides being delicious, they are also powerful and effective. Their benefits have been noticed by veterinarians as well, as they, too, recommend this solution. Furthemore, the chews are made with soluble ingredients that are safe and easy to digest. 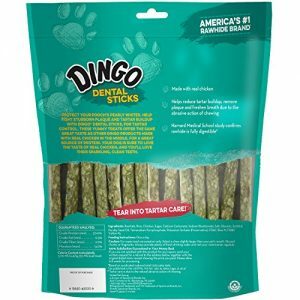 If you are in the market for some cheap dental sticks for dogs, that are also effective, then you can surely take a look at Dingo’s Tartar and Breath Chicken Dental Chews. These combine powerful flavors into a tasty treat that removes tartar and plaque by using your dog’s natural chewing habit. Each of the sticks also represents a good source of protein, as these are made with real chicken. The added freshness comes from ingredients such as baking soda and parsley seeds, while the chicken treat is in the middle, making your dog work for it. Moreover, they are suitable for dogs of all sizes and you can safely feed your pup one a day. However, the manufacturer does advise the supervision of the dog while he or she chews in order to avoid swallowing entire pieces. A good gum massage is also ensured, and the sticks come packaged in a conveniently resealable bag that helps preserve their freshness and properties. Going through dog dental sticks reviews can help you choose the right oral care solution for your dog, and since you are here, you can take a look at Virbac’s C.E.T. 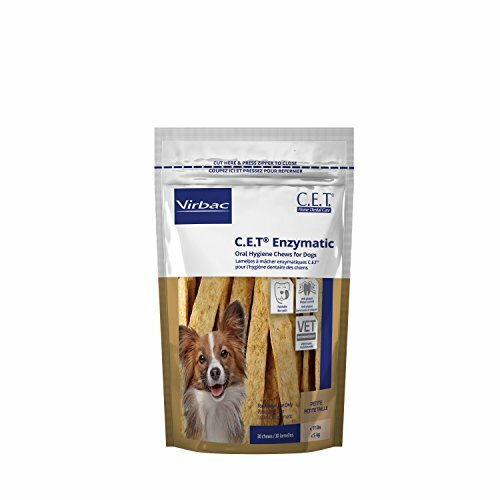 Enzymatic Oral Hygiene chews, as this might be the answer to your dog’s needs. These snacks combine natural antiseptic activity with an abrasive action for clinically proven plaque control. This means that if you give them a try, you might be able to skip getting that plaque removed by the veterinarian through the more complicated procedure that includes anesthesia. Moreover, the exclusive Dual-Enzyme system that this product features helps eliminate plaque-forming bacteria, while the chews themselves are made of selected beef hide. For optimal results, the manufacturer recommends giving your dog at least one chew every day. This habit will help reduce plaque and calculus, which means your dog will be healthier and will enjoy his strong chewing capabilities for a longer period of time. 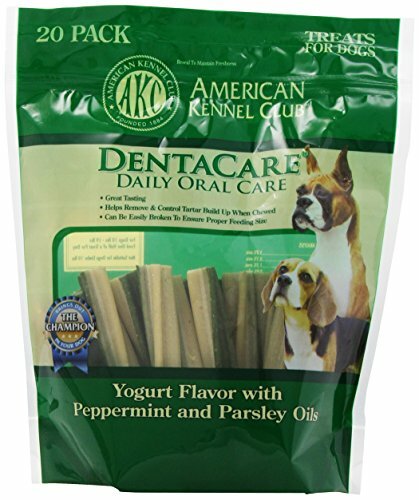 In case you are going through multiple alternatives available for sale and you’re uncertain which one to choose, then you can take a look at these American Kennel Club Peppermint-Parsley DentaCare treats. The fact that they are made by the American Kennel Club is already an indicator that expert advice was put to good use and that you can rest assured that these are effective. Taste is, of course, an important element when it comes to treats that have to attract a dog’s interest, and this product is definitely delicious. Efficient ingredients such as yogurt, peppermint, and parsley oils are used in the fabrication process, and the chews help remove and control tartar build-up. The formula also works for fresher breath. In case your dog is smaller or larger and you are not sure if these are the right size for his or her mouth, then it’s good to know that the snacks can be easily broken into pieces for a suitable feeding size. Do you feel like you need to keep an eye on your dog’s weight? It doesn’t matter if he or she just loves food, or the issue is a result of other physical imbalances, if your dog needs to lose some weight but you still want to spoil him or her with some delicious treats, we found the right solution. 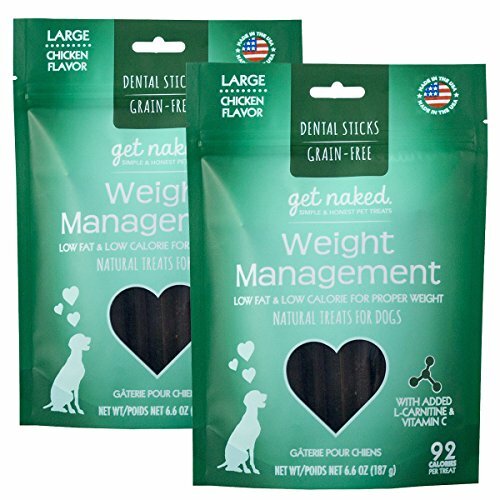 Get Naked’s Grain Free Weight Management Sticks contain no wheat, corn, or soy, but do include a mouth-watering chicken flavor. The result? A satisfying, guilt-free treat that also sustains a good oral hygiene. Using your dog’s natural chewing habit, these treats also help remove plaque and tartar, which means that future problems can be avoided. Moreover, the sticks are also formulated with L-Carnitine which helps boots and support metabolism, for better weight loss results. Now that you have all the information related to these sticks, you most probably agree with us that these are a great alternative to keep your dog healthy, happy and fit. Choosing the treat that offers full oral care for your pet is not as difficult as other things you will need to think about in your life together, such as how to use a boarding kennel for your pet or which option is better between pet sitters vs kennels. However, there are some guidelines you can take into account before venturing into the large pool of options available on the market. The good news is that you will find out what these are in the following minutes, so let’s get to it. If you are planning to buy the chews for a puppy, then most probably you are not dealing with plaque issues yet, and are just doing this as a precautionary method. This is excellent, but keep in mind that puppies have a reduced chewing strength and their teeth are still developing, so you should go for a softer option that is more fun than anything else. On the other hand, if your dog is fully developed and has strong chewing capabilities, then you will want to go for a tougher alternative that is harder to chew on. This will ensure the necessary friction to actually remove the plaque or tartar through the chewing process. Dental chews come in various shapes, sizes and formulas. While some are presented as a nutritious alternative, others go for a more natural approach without added supplements. If you want to choose one option or the other, then you need to make sure you carefully read the ingredients listed on the package. Keep in mind that while a nutritious alternative might seem like a good idea, you should first make sure that your dog actually needs extra vitamins or proteins. For example, too much protein can cause kidney problems, since these are macromolecules that require additional kidney action in order for them to be properly filtered by the body. Like in any other area in your life together, balance is the key, so you might want to check with a veterinarian before making your choice. As a general rule, pick the products that contain only natural ingredients. You might ask yourself if your dog really needs a dedicated action plan for his or her oral hygiene. Given that our beloved friends spend most of their time licking, biting or chewing something, they come in contact with a large number of bacteria and fungi that are more than happy to develop further. This habit is part of a dog’s life, which means that it’s better to take action as early as possible and prevent future visits to your veterinarian or, worse, additional eating problems when he or she gets older. The benefits are numerous, including an improved teeth and gum health, a reduced bad breath, and the prevention of periodontal diseases. If dogs are not the only pets in your life, and you are also the proud parent of an adorable cat you can read some of our other articles on various other topics such as finding the most useful automatic cat feeders, effective cat flea treatments, or some really fun cat toys. Would you enjoy meals consisting of the same thing over and over again, for the rest of your life? No? Well, the same goes for your dog. Have you ever caught the “thanks, but no thanks” look when you gave your dog the food bowl? 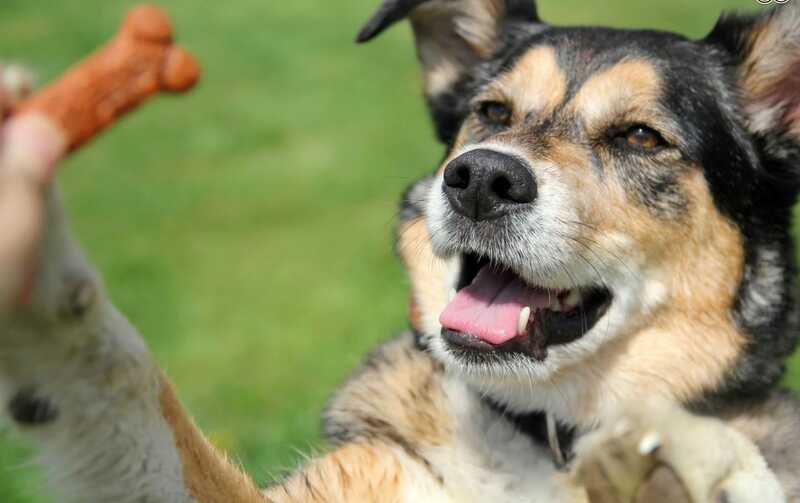 The good news is you can get on your dog’s good side again and here is how you can provide your pet with a variety of organic dog food of your choice. Carrots are a sweet and crunchy treat, which can also be beneficial for the liver, especially if your dog is undergoing medical treatment. Bell peppers are an absolute delight. Your dog would be most pleased if you were to look for female peppers, the ones with four bumps, which are much sweeter. Carefully remove the seeds, and you are good to go. Green beans also make a good snack, as they are a great source of fiber, vitamins, and manganese. Make sure to cut the ends off and wash them thoroughly. Sugar snap peas are a great source of protein, fiber, folate, phosphorus, manganese, potassium and zinc. Sweet potatoes can be used as treats also, after being boiled or dehydrated. They are a good source of magnesium, potassium, and vitamins A, B5, B6 and C.
Celery is a crunchy treat and a good source of vitamins A, B and C, potassium, calcium, sodium, iron, and phosphorus. Cucumbers are low in calories, and an excellent source of vitamin K. Wash them, cut them lengthways and remove the seeds. Apples are high in fiber, and a good source of vitamins A and C. Always wash them thoroughly and remove the core, stem, and seeds before giving one to your dog. Blueberries are a great way to increase the number of antioxidants in your dog’s body, they are low in fat and contain vitamin C and fiber. They are better served outside, as they are known to stain everything, and they make a special treat if you keep them in the freezer for a while before serving them. Bananas are high in fiber, potassium, and magnesium, vitamin B6, and C. Not all dogs like them, but if you slice the bananas first and then freeze them, they are sure to be a success. Watermelon is always at hand in the summer days, and is a great source of water (92%), vitamins A and C, potassium and magnesium. Always be careful to remove the seeds first. Cantaloupe contains vitamins A, B and C, potassium, and beta-carotene. Make sure you remove the seeds and rind before serving it. The warm season is starting, and soon the markets will be filled with fresh vegetables and fruit, a healthy choice compared to store-bought snacks, which can be high in sugar, fat, and preservatives. 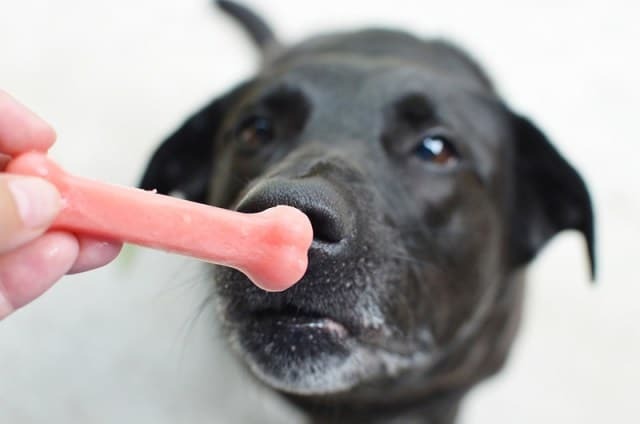 In the hot summer days your dog will appreciate a refreshing veggie treat, but too much of anything is always bad for anyone, dogs included, so do not overdo it with the treats in detriment of a balanced diet.